Sunday Morning Soliloquy - Musings of an Urbanite: Official archives reveal the last year Leyla was cool! Official archives reveal the last year Leyla was cool! When did I stop being cool? I find myself asking that question more and more. Artifacts discovered while cleaning out my storage unit, finally answered the question I had long been asking myself! This is big, it's like the holy grail, the Magna Carta or the missing link that answers the question... what the hell happened to Leyla? She used to be cool! My apartment is tiny and I've been debating a move for quite some time, but instead, I decided to get organized. For the past month, I've been going through my storage unit, opening boxes, dumping contents, tossing things & reorganizing what remains in order to create more room for more crap I feel the need to store. Last weekend, I was down to the final 3 or 4 boxes when I made riveting discovery. I thought I had gone through all my concert boxes, most of it was already organized into one big box. But then I found a little box inside of a bigger box and the contents inside this little box were stunning. 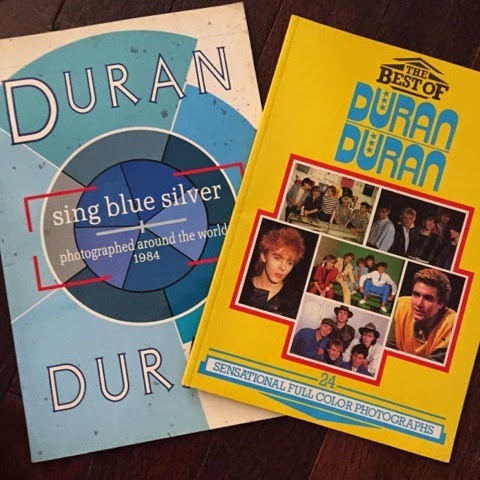 When I opened the box, at very top were two mint condition Duran Duran picture books! My brain could not conceive what my eyes were showing me, what were these rare books? I had no recollection of these books! And more importantly, what else was inside this magical box that had gone undetected all these years? The evidence of the last year I was cool lived Inside this cherished box! 1999 - 2000 was the last year I was cool! 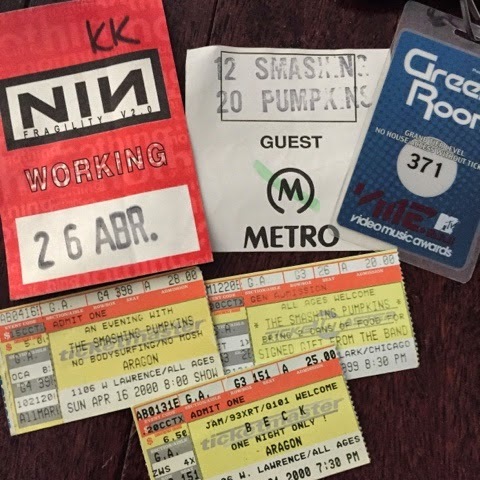 I lifted the books and saw a big red all-access Nine Inch Nails "Working" badge, a Smashing Pumpkins "Guest" badge, and a Green Room pass to the MTV Awards. I slowly pulled the contents out of the box, held the artifacts in my hands, and said out loud... "Oh my god, this was the last year I was cool..."
I sat there for a while and reminisced about that Beck show and all the friends I had back then. I thought about the time I saw Prince twice in the same night, first at the Aragon, and then he played until 4AM at the Metro. And the time I was backstage at a Korn show (I don't even like Korn) and ended up going bowling with them afterwards. I met a doctor that night, and we later went on a date, all I will tell you is that you should NEVER go on a date with a doctor you meet backstage at a Korn concert! I cannot caution you enough about this. What happened to me after 2001? I asked myself that too! WTF happened after the MTV Awards in 2001?!? And then I remembered, I met a nice guy who wanted to me to settle down. If it were not for this recent discovery, I truly don't think I ever would've made the correlation that the bridge between Cool Leyla and Lame Leyla was the boyfriend who shall not be named, but we can call him Tiny Dancer. I can hear his little voice in my head, "Oh, you're going to blame me for this too now?" You bet I am Tiny Dancer, you bet I am.